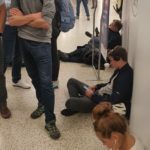 Having just travelled from Manchester to JFK on an 8 hr flight we were not happy at being met with the huge queues at immigration. It took 2 hrs of queuing to eventually get to the front only to be sent to queue at individual kiosks. There were only 3 kiosks open to deal with the huge amount of travellers. The room was very hot and the staff were miserable. Very surprised to find out JFK is in such a run-down condition. Arrived on a Delta flight from Moscow and had to enter through a dark and gloomy passageway with low ceilings and paint peeling off. Immigration lines were excessively long airport and immigration staff were very rude to the point of just barking orders at passengers. The TSA staff inside the terminal were fast and friendly. The main problem with JFK is the people. There is a complete lack of courtesy friendliness training and in most cases language skills. The signage is lacking. There are simply no signs in other major languages. The friendliest people are the Customs and Border Protection agents. I have always been treated courteously and often in a friendly manner. Most of the terminals are out-of-date or poorly designed. Restaurants are fair-poor and over-priced. I cringe when I need to change terminals. I am forced to use JFK because of the good flight schedules. 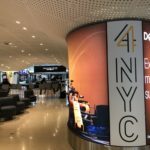 Flew into JFK Terminal 4 and went through immigration after suffering through an extended wait and an overly sarcastic interview with the security officer. Customs was uneventful as was the brief AirTrain ride to Terminal 3 for my connecting flight. Terminal 3 Delta Airlines check-in went smoothly. TSA checkpoint to the gates was the worst airport security fiasco I have ever had to endure in over 20 years of flying. Three times we were asked to relocate to different security entrances due to extremely long lines and/or faulty equipment. One security entrance had 3 machines fail simultaneously. Staff members were loud but generally clueless on efficiently directing passengers to alternate security entrances. People at the front of one queue ended up at the back of the next queue when they were made to move. Overall it took me 2.5 hours to clear security. Again JFK (terminal 4) lived up to its expectations. On this Saturday afternoon it took over 1.5 hrs to pass through Immigration. Don't they know that so many thousand visitors will arrive or don't they care? Officials were correct and friendly. No problems on that side. As insufficient baggage belts were available they dropped our baggage somewhere in the middle of the baggage hall adding to passenger confusion. Prior to my wife and I going to Europe I knew we would be flying back to the US via JFK instead of ATL which we originally planned. 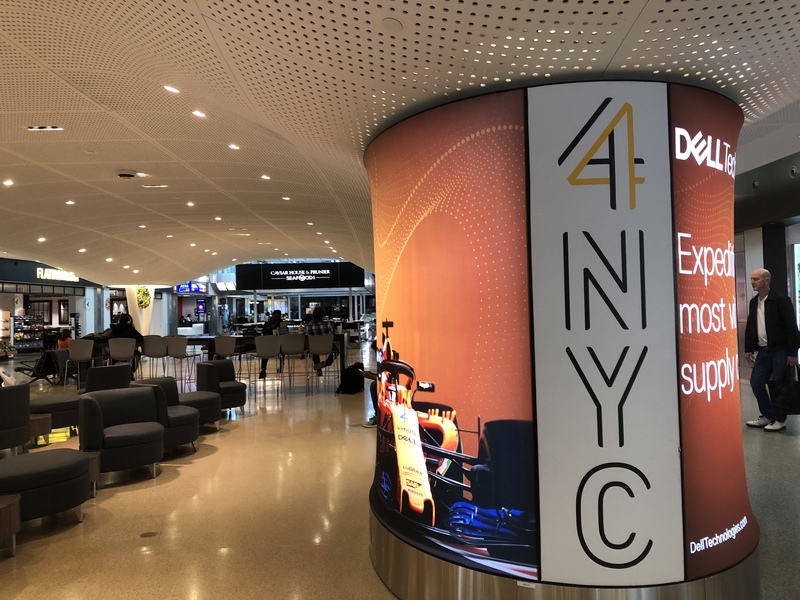 We arrived at JFK from Rome (FCO) via Delta and I was surprised. Everything went smoothly from passport control retrieving our luggage and re-checking to going through security again. Employees were helpful and courteous. However given the layout of the airport and the heavy volume of passengers this airport handles things do have the potential to go south in a second. Additionally NYC was not my destination so I did not have to rent a car or take a taxi to Manhattan. Had I done these things maybe my review would be a bit different. I will say the layout of the airport needs to be updated and the food choices could be improved. However we waited for our connecting flight in another part of terminal 4 (I believe Delta gate 23) There were a few decent places to grab a bite to eat or grab a beer. You are not going to get the amenities that you would at the Atlanta or similar airports but this isn't the worst airport either. I would consider using JFK for a future international flight. Arrived from Rome to Terminal 8 (American Air) around 1.00 pm. We have had poor previous experiences at JFK and we braced for another. This time was better. Facility was clean signs were clear along the way to customs helpful staff were visible with forms and keeping the lines moving. The CBP officer reviewing our passport was friendly and efficient. After retrieving our baggage and giving it again to American for the domestic flight to San Diego we then got our surprise. 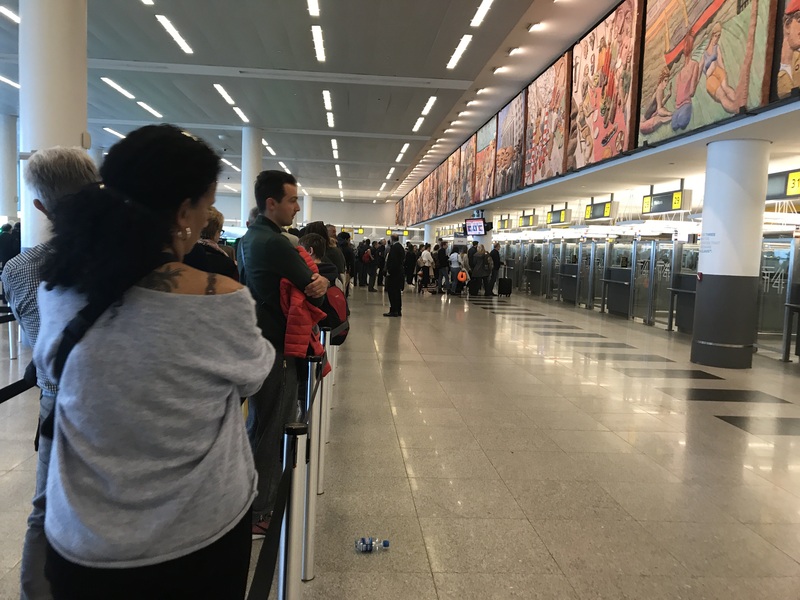 Terminal 8 is not fully secure meaning that cleared travelers exiting customs to go on to another American domestic flight must go through security again. That meant the duty free sealed glass items we purchased in the secure Milan terminal would not be allowed by TSA - they take it or you are escorted out right away. American Air staff at the counter went out of her way to find boxes to help us pack these items and checked it through at no additional fee. Either we missed something or there is a design flaw with terminal security. Arrived last night at Terminal 8 from Paris. 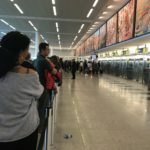 The line for immigration was terribly long staff directing passengers rude and uninformative. The booths for the immigration officers were only one third manned. They know how many passengers will be coming through. It took over 1 hr for us to get through and we were in the short line for US Citizens. The Visitors line was at least three times as long. These poor people probably had to wait 3 hrs. What a terrible welcome to the United States. The staff varied from ignorant and rude to aggressive. We queued for an hour to check-in then queued for 30 mins to put our bags through the x-ray over 1.5 hrs to get through security. No signs at security in terms of how they wanted people to go through the x-ray. After watching people be shouted at for not moving forward quickly enough we finally saw the security gates. How this can be accepted at a major international airport is beyond me.